It seems only right that as we have asked for your help, we provide a clear breakdown of how we manage our finances. The vast majority of Gonzaga’s yearly operating revenue (95%) comes from tuition, room and board charges. 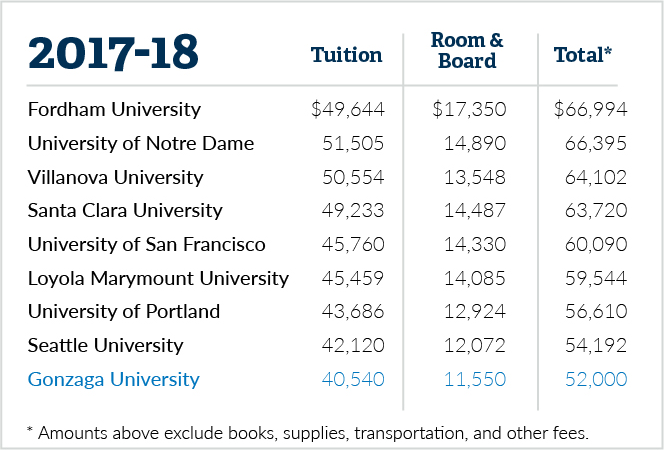 For the 2017-2018 academic year, Gonzaga’s undergraduate tuition costs was just over $40,000; with room and board, and other expenses, that total nearing $58,000. We understand this is a very significant financial investment for students and families. Therefore, we have worked diligently to keep Gonzaga’s costs below our regional peers while maintaining exemplary educational quality. Currently 99% of all undergraduates receive a combination of need- and merit-based financial aid, directly from a Gonzaga University grant or scholarship. From every dollar of Gonzaga’s operating revenue, we reinvest 31 cents as financial aid for our students. Nearly all of what remains from each dollar then goes toward keeping the university running: compensation for our faculty and staff, maintaining facilities, programming and other operations. This financial dynamic puts great stress on the university’s budget, and prevents us from further relieving the cost burden on our students. Of the nearly $90 million we invested in financial aid for the 2017-18 year, $4.8 million came from donor-supported endowed scholarships. Without greater support for scholarships, students must seek loans to fund their education, resulting in average debt of $30,700 (after graduation) per student. We must do more—and growing the university’s endowment is the answer. What is an endowment? It serves as a “permanent fund” by generating sufficient returns to support annual spending. Drawing on the interest, while leaving the core capital intact, we can tackle large projects, plan expansions, and offer more financial support to students without sacrificing Gonzaga’s financial security. Unfortunately, compared to our peers, Gonzaga’s endowment is far too low, both in total dollars and the portion available to support each undergraduate. Simply put, we cannot hope to grow as a university unless we grow our endowment. The chart above illustrates that the amount of endowment per student is below all of these peer instittutions. Keeping Gonzaga affordable for families throughout a student’s entire four-year experience is key to our mission of fostering the smart, courageous individuals who will make our world a better place. That’s why Gonzaga Will is critical—and why your participation is, too.